Browse: Home → Fishery Management Plan Completed for Teal and Lost Land Lakes! Wisconsin DNR’s Sawyer County Fishery Management Biologist, Max Wolter, has completed a major project aimed at maintaining and improving the quality of fishing on Teal and Lost Land lakes. Co-authored with QLIA President Dave Neuswanger, the November 2018 Fishery Management Plan culminates a process begun in 2006 when Dave (as WDNR Area Fisheries Supervisor) facilitated a visioning session at the Spider Lake Town Hall, offering QLIA members an opportunity to weigh in on fish species priorities and preferences. This novel approach to documenting stakeholder interests on an ecosystem-specific basis and setting goals accordingly was embraced by Max, who conducted a more inclusive online survey of area anglers in 2018 that confirmed earlier results. The end product is a plan that reflects stakeholder priorities and preferences while offering specific, science-based recommendations for fish harvest, stocking, and habitat management. 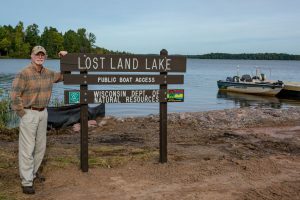 Teal and Lost Land are now among only a handful of Wisconsin’s 15,000 lakes that have customized fishery management plans. CLICK HERE to go to the Fisheries Planning page, download a PDF copy of WDNR’s recently released plan, and read a synopsis of the plan by QLIA President and Fisheries Program Leader Dave Neuswanger. I wish Illinois DNR would treat our fishery more like the DNR in Wisconsin. Great job guys!